Season 27 continues to air, and news from Season 28 are adding up! Today, in collaboration with The Springfield Shopper, Wikisimpson‘s blog, we’re going to analyze what we know so far of this season and the following! Follow us right after the jump! The following article contains the second part of the news, with all the news that come out in the first part of 2016. To follow the other posts click here: 2015, 2016 part 2, 2016 part 3, 2016 part 4 and 2017 part 1, 2017 part 2, 2017 part 3, 2017 part 4 and 2018 part 1 and 2018 part 2! FOUR New Sneak Peek, FIVE Promotional Images and the Couch Gag for “Teenage Mutant Milk-Caused Hurdles” have been released! FOUR New Sneak Peek, FIVE Promotional Images and the Couch Gag for “Teenage Mutant Milk-Caused Hurdles“, which will air on January 10, 2016, have been released by FOX. The episode will be the 11th episode of Season 27. The second trailer is part of the Sunday Funday trailer. The couch gag is by guest animator Steve Cutts. “Teenage Mutant Milk-Caused Hurdles” will guest star Sofia Vergara as Mrs. Berrera. A Sneak Peek has been made private and was removed. FIVE Promotional Images for “Much Apu About Something” have been released! FIVE Promotional Images for the upcoming 12th episode of season 27, which is titled “Much Apu About Something“, have been released by FOX. The episode airs on January 17, 2016. Two Sneak Peeks for “Much Apu About Something” have been released! Two Sneak Peeks for the upcoming 12th episode of season 27, which is titled “Much Apu About Something“, have been released by FOX. The episode airs on January 17, 2016. Professor Frink Attempts to Uncover the Secret of Women in Valentine’s Day! Information about the plot for the episode “Love Is in the N2-O2-Ar-CO2-Ne-He-CH4“, which will air on February 14, 2016 (a day also known as “Valentine’s Day”); has been released by FOX. The episode will be the 13th episode of Season 27. S28 Premiere episode title revealed! The title of the episode that will air in Fall 2016 as the season premiere of Season 28 is “Monty Burns’ Fleeing Circus“!!! The production code of the episode is VABF20. Bart Takes In a Talented Homeless Woman in February! Information about the plot for the episode “Gal of Constant Sorrow“, which will air on February 21, 2016; has been released by FOX. The episode will be the 14th episode of Season 27. The actress Kate McKinnon and the singer Natalie Maines will guest star as Hettie and Hettie’s singing voice respectively. Two Teasers, THREE Promotional Images and a Poster for the upcoming 13th episode of season 27, which is titled “Love Is in the N2-O2-Ar-CO2-Ne-He-CH4” or “Love Is in the N2-O2-Ar-CO2-Ne-He-CH4“, has been released by FOX. The episode airs on February 14, 2016, Valentine’s Day. The teasers have made private and were removed. Lisa Interns for a Veterinarian in March! Informations about the plot for the episode “Lisa the Veterinarian“, which will air on March 6, 2016; has been released by FOX. The episode will be the 15th episode of Season 27. The actor Michael York will guest star as “Dr.Budgie”. 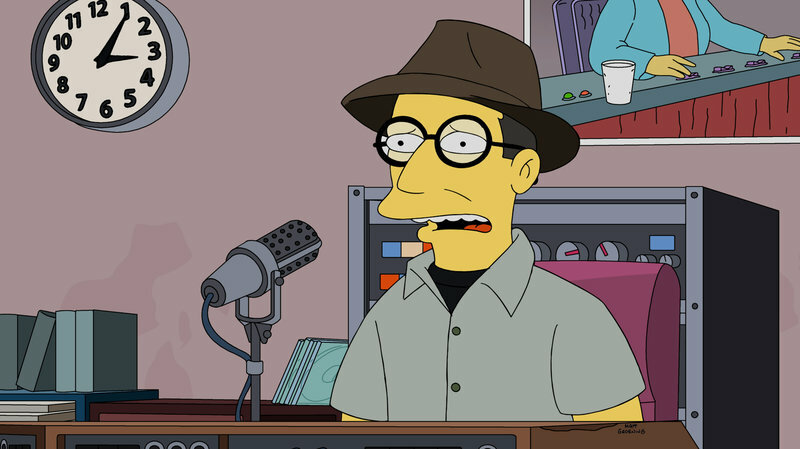 York had already been a guest star in The Simpsons when he guest starred as Mason Fairbanks in Season 17. Lisa signs up for the Mars One Space Colony in March! Informations about the plot for the episode “The Marge-ian Chronicles“, which will air on March 13, 2016; has been released by FOX. The episode will be the 16th episode of Season 27. Not feeling unique, Lisa signs up for the Mars One Space Colony – to Marge‘s dismay. Then, Marge hires Bart to go through the tryout process with Lisa to make her want to quit. Tom Scharpling and Jon Wurster, from “Steven Universe”, will guest star as “Paul” and “Barry” respectively. The Couch Gag for “Love Is in the N2-O2-Ar-CO2-Ne-He-CH4” have been released! The Couch Gag for the upcoming 13th episode of season 27, which is titled “Love Is in the N2-O2-Ar-CO2-Ne-He-CH4” or “Love Is in the N2-O2-Ar-CO2-Ne-He-CH4“, has been released by FOX. The episode airs on February 14, 2016, Valentine’s Day. The Couch Gag has been made private and was removed. Glenn Close returns from Grampa’s memories in the Valentine’s episode! 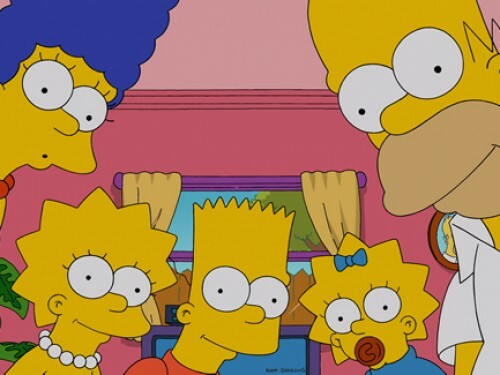 Sunday a new episode of The Simpsons airs, the Valentine’s Day episode, titled “Love Is in the N2-O2-Ar-CO2-Ne-He-CH4” or “Love Is in the N2-O2-Ar-CO2-Ne-He-CH4“, 13th episode of Season 27. A special preview was shared by TVLine, revealing this Sunday, Mona Simpson will return from Abe’s memories, voiced once again by Glenn Close, after the residents of the Retirement Castle suffer from drug-induced hallucinations. We’d like to thank TVLine for the article. A new Teaser for the upcoming 13th episode of season 27, which is titled “Love Is in the N2-O2-Ar-CO2-Ne-He-CH4” or “Love Is in the N2-O2-Ar-CO2-Ne-He-CH4“, has been released by FOX. The episode airs on February 14, 2016, Valentine’s Day. A Sneak Peek for Gal of Costant Sorrow has been released! A Sneak Peek for the upcoming 12th episode of season 27, which is titled “Gal of Costant Sorrow“, have been released by FOX. The episode airs on February 21, 2016. Homer to Appear Live on May 15th! Dan Castellaneta is to voice Homer Simpson live on the May 15th episode of The Simpsons! During the episode, Marge, Lisa and Bart will turn the show over to Homer who will take a break from stuffing his face to comment on the events of the day LIVE during both the East Coast and West Coast broadcasts. From May 1st to the 4th, fans will be able to tweet questions that Homer could answer using the hashtag #HomerLive. The episode, which is currently unknown, will be the penultimate episode of season 27. Update: Dan Castellaneta will be motion captured to get lip movements and gestures incorporated into what Homer does on the screen. Three New Sneak Peeks for Gal of Costant Sorrow has been released! Three New Sneak Peeks for the upcoming 12th episode of season 27, which is titled “Gal of Costant Sorrow“, have been released by FOX. The episode airs on February 21, 2016. The teaser has been made private and was removed. SIX Promotional Images for “Lisa the Veterinarian” have been released! SIX Promotional Images for the upcoming 15th episode of season 27, titled “Lisa the Veterinarian“, have been released by FOX. The episode airs on March 6, 2016. First table read of season 28 reveals a new episode title! Showrunner Al Jean just revealed on Twitter the title of the first episode of the new production series [WABFxx], the 28th production season. And the first episode of the new production season, which has the production code WABF01, is titled “Dad Behaviour“! The WABFxx episodes will start airing during the next “broadcast” season, Season 28! To check Al Jean’s tweet click here! Three Sneak Peek for “Lisa the Veterinarian” have been released! Three Sneak Peek for the upcoming 15th episode of season 27, titled “Lisa the Veterinarian“, has been released by FOX. The episode airs on March 6, 2016. Details for the upcoming 17th episode of season 27, which is titled “The Burns Cage“, has been released by FOX. The episode airs on April 3, 2016 and Homer turns to a dating app to help find Smithers a boyfriend. George Takei will special guest as himself. 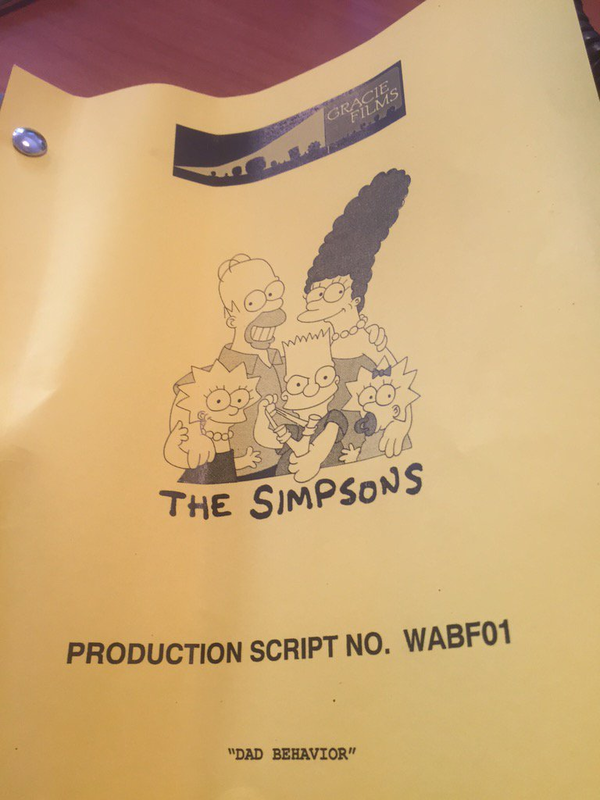 An air date for the episode “How Lisa Got Her Marge Back“, has been released by Al Jean on Twitter. The episode will be the 18th episode of Season 27. We will see Marge take Lisa on a girls trip to Capital City where they attend a performance of Bad News Bears: The Musical, starring Andrew Rannells. The episode will air April 10th, 2016. SEVEN new Promotional Images for “The Marge-ian Chronicles” have been released! SEVEN new Promotional Images for the upcoming 16th episode of season 27, titled “The Marge-ian Chronicles“, have been released by FOX. The episode airs on March 13, 2016. A new script just revealed the title of the second episode of the new production series [WABFxx], the 28th production season. And the episode, which has the production code WABF02, is titled “The Nightmare After Krustmas“! The WABFxx episodes will start airing during the next “broadcast” season, Season 28! Stay tuned for more! Three new Sneak Peeks for “The Marge-ian Chronicles” have been released! Three new Sneak Peeks for the upcoming 16th episode of season 27, titled “The Marge-ian Chronicles“, have been released by FOX. The episode airs on March 13, 2016. Marge Will Take Lisa on a Girls’ Weekend in April! Informations about the plot for the episode “How Lisa Got Her Marge Back“, which will air on April 10, 2016; has been released by FOX. The episode will be the 18th episode of Season 27. The actor Andrew Rannells will guest star as Himself. 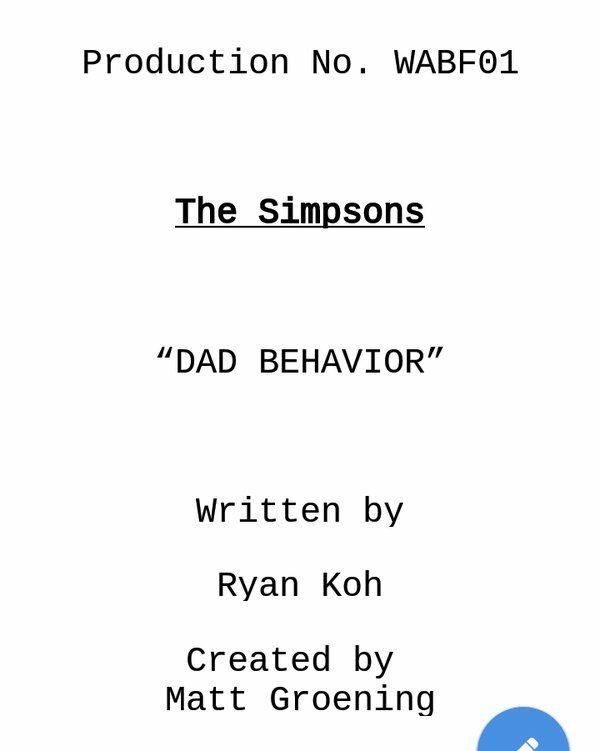 After announcing the title of the first episode of the new production series [WABFxx], the 28th production season, “Dad Behavior“, the Writer of the episode was just announced to be Ryan Koh. Ryan was the Supervising producer of 5 episode from Season 27. To check Chris Edelma’s tweet click here! While The Simpsons are taking a few weeks off, returning April 3rd with the 17th episode of Season 27, “The Burns Cage“, news on future episodes keep coming. The writers and director for Season 28 episode “Monty Burns’ Fleeing Circus” and the director for Season 27 episode “Friends and Family” have been revealed. Tom Gammill and Max Pross will be the writers and Matt Nastuk will be the Director of “Monty Burns’ Fleeing Circus“. Lance Kramer will be the director of “Friends and Family“. FOUR Promotional Images for “The Burns Cage” have been released! FOUR Promotional Images for the upcoming 17th episode of season 27, titled “The Burns Cage“, have been released by FOX. The episode airs on April 3, 2016. SIX Promotional Images for “How Lisa Got Her Marge Back” have been released! SIX Promotional Images for the upcoming 18th episode of season 27, titled “How Lisa Got Her Marge Back“, have been released by FOX. The episode airs on April 10, 2016. 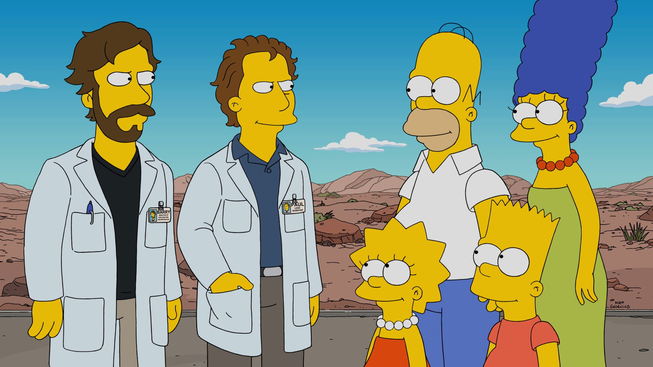 The Simpsons and Flanders Will Take a Trip to the Grand Canyon in April! Information about the plot for the episode “Fland Canyon“, which will air on April 24, 2016; has been released by FOX. The episode will be the 19th episode of Season 27. A Teaser Trailer for “The Burns Cage” has been released! A Teaser Trailer for the upcoming 17th episode of season 27, titled “The Burns Cage“, has been released by FOX. The episode airs on April 3, 2016. The teaser trailer has been made private and was removed. A new script just revealed the title of the thirdepisode of the new production series [WABFxx], the 28th production season. And the episode, which has the production code WABF03, is titled “Fatzcarraldo“! Two Sneak Peeks for “The Burns Cage” have been released! Two Sneak Peeks for the upcoming 17th episode of season 27, titled “The Burns Cage“, have been released by FOX. The episode airs on April 3, 2016. A Teaser Trailer for “How Lisa Got Her Marge Back” has been released! A Teaser Trailer for the upcoming 18th episode of season 27, titled “How Lisa Got Her Marge Back“, has been released by FOX. The episode airs on April 10, 2016. Information about the plot for the episode “Monty Burns’ Fleeing Circus“, which will air on Fall 2016; has been released by FOX. The episode will be the Season 28 premiere. Two Sneak Peek for “How Lisa Got Her Marge Back” has been released! Two Sneak Peeks for the upcoming 18th episode of season 27, titled “How Lisa Got Her Marge Back“, have been released by FOX. The episode airs on April 10, 2016. Information about the plot for the episode “To Courier with Love“, which will air on May 8, 2016; has been released by FOX. The episode will be the 20th episode of Season 27. Jay Leno also returns in the show, making guest-voice appearance as himself. Homer Will Try Improve to Overcome a Case of Stage Fright in May! Information about the plot for the episode “Simprovised“, which will air on May 15, 2016; has been released by FOX. 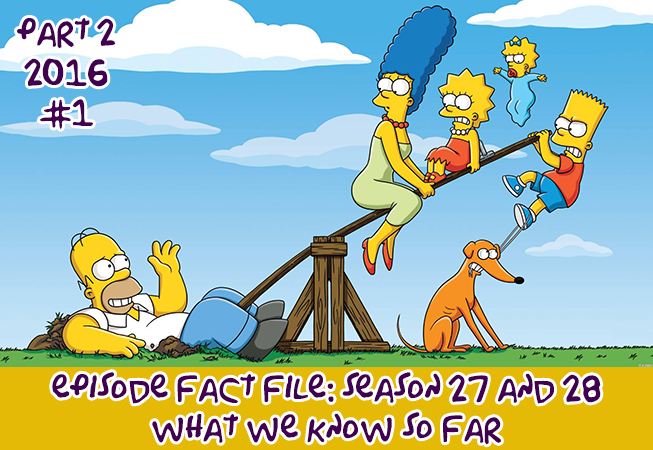 The episode will be the 21st episode of Season 27. Two Teaser Trailers for “Fland Canyon” have been released! Two Teaser Trailers for the upcoming 19th episode of season 27, titled “Fland Canyon“, have been released by FOX. The episode airs on April 24, 2016. The second trailer includes teasers for other series that’ll air that night. The teaser trailers have been made private and were removed. SIX Promotional Images for “Fland Canyon” have been released! SIX Promotional Images for the upcoming 19th episode of season 27, titled “Fland Canyon“, have been released by FOX. The episode airs on April 24, 2016. The Couch Gag and Two Sneak Peeks for “Fland Canyon” has been released! The Couch Gag and Two Sneak Peeks for the upcoming 19th episode of season 27, titled “Fland Canyon“, has been released by FOX. The episode airs on April 24, 2016.